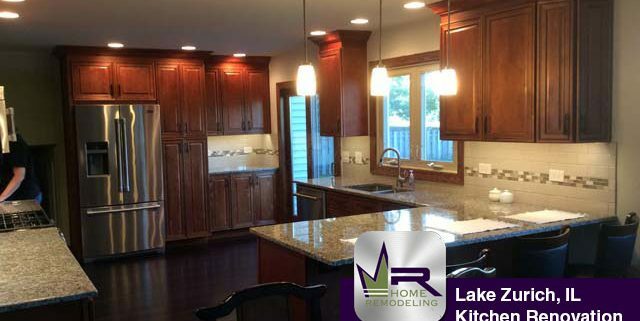 The kitchen of this lovely home was ready for a major remodel in every way. The residents were tired of the style and were ready for a change in style as well as structure. A big part of the job was the removal of a partition wall that had previously divided the kitchen and the dining room. 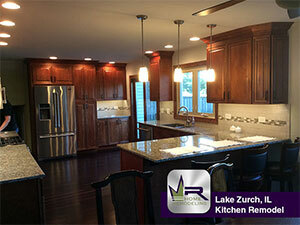 The village of Lake Zurich and its entire community is built around a large lake.Lake. The residents of Lake Zurich are drawn to the village because of itstranquil environment while still offering the finest schools. It is a very stable community and a sought after community to raise a family.Lake Zurich covers 7-mile radius and is located 45 minutes outside of Chicago.